Eternal Aesthetics Clinic, Cosmetic Clinic in Palmers Green , Southgate, Enfield, North London. Similar in concept to Dermal Hydrating Treatments - although, we can safely say that those are based on the principles of mesotherapy, rather than the other way around - the process usually involves multiple tiny injections to administer microscopic quantities of homeopathic medications, traditional pharmaceuticals, vitamins, minerals and amino acids into the skin. These days you can also get 'no-needle' mesotherapy, where the products are delivered into the skin using low frequency electric currents. Whether traditional or no- needle mesotherapy is used, the cosmetic aim is usually to replace vitamins and minerals that the skin loses as we age, although it can also be used to treat cellulite. Unless you have an allergy to any of the ingredients in the products used, mesotherapy is suitable for pretty much anyone. If you have really deep lines and wrinkles, however, this probably isn't going to produce the results you are looking for, so you might want to consider Muscle Relaxing Injections ( Botox) or Dermal Fillers. Mesotherapy deeply moisturises, smooths and replenishes the skin without altering the facial structure and expression. In this way you maintain your personality while improving your skin quality. 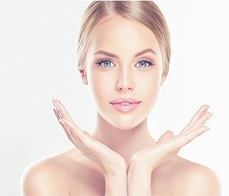 The Mesotherapy treatment greatly compliments the Mesopeel and you can have individually or together. Whichever treatment option you go for, the procedure shouldn't take longer than about ten minutes and it's not painful so you won't need an local anaesthetic. In traditional needle- based mesotherapy, the chosen ingredients are administered in multiple micro-injections to the treatment area. There are a few different techniques for these injections, so it might be worth asking your practitioner which is their preferred method and why. In no-needle mesotherapy, a hand-held device is passed over the treatment area, emitting the ingredients via an electric current. You may experience a slight tingling sensation, but it shouldn't be painful. There might be a small amount of redness or bruising on the treatment area, but this will fade quickly and you should be able to return to normal activities immediately. A course of treatments is usually recommended to produce measurable results - you won't see the effects of the treatment straightaway. For best results and help improve Cellulites,fluid retention, local fat, loss of firmness and elasticity a Combination Cryolipolysis and Mesotherapy treatment will leave your skin firmer, morehydrated and with higher elasticity. If you are interested in this procedure please review our prices here and book online.